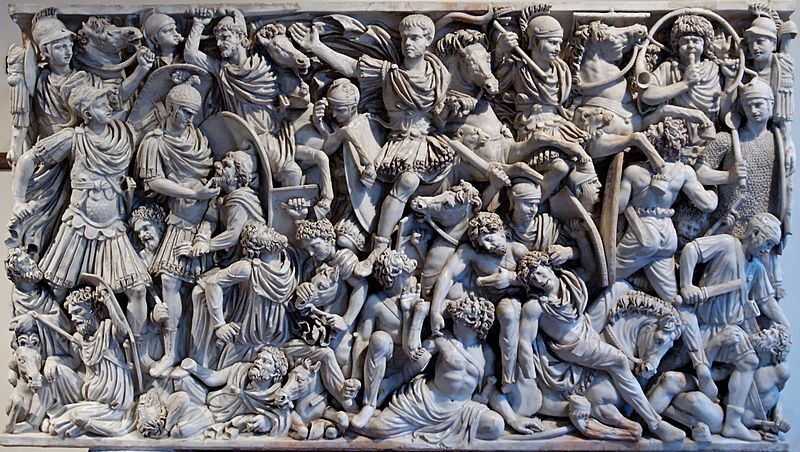 The Grande Ludovisi Sarcophagus – Depicting battle between Roman soldiers and Goth warriors. Names—I haz ‘em: Lots of ‘em. My trilogy is based on the world of the epic culture clash between the Germanic tribe of the Goths and the ancient Roman Empire. Tom Shippey, Tolkien’s biographer, makes a case in J.R.R. Tolkien: Author of the Century, that for Tolkien everything started with the names. I took him to heart. One of the first things I did, before I wrote a single line of prose, was to come up with the names. I just found my notes, dated January ’04 (I started outlining the story in November of ’03). I made lists of Gothic, Old Norse, Greek, and Latin words I thought were pertinent to the story and the world I wanted to create. I invented names not only for characters, but for nations, tribes, cities, seas, provinces, empires (yes, plural), oaths, clans, religious elements and ceremonies. I have characters with invented names as well as invented titles, and even invented nicknames. I even named a few swords (are you scared yet?). Heck, I even named the horses; over a dozen of them (now you’re scared, right?). Yes, I did something like this for every one of my names. Not all of them were quite this elaborate, but they all have meaning. Some I just had fun with, for example the names of two of the Roman antagonists. Malvius is rooted in the Latin malevelle: of evil intent. And Turgian is from the Latin turgere: to swell (as in his head, with pride). Submariner: In the pursuit of creating my own distinct world, and in the interests of relating the story without the encumbrance of historical facts, I even changed the names of all ‘real’ places and peoples. I made the Romans into Tiberians, the Goths into the Gottari, and so on. I explain why in a bit more depth on the homepage of my website in a post called The Origin of Epic, but to summarize, I did it to gain a bit of distance from the readers’ preconceptions. I was hoping to accomodate total submersion in my world, to take readers on a voyage without having them bring their baggage onboard the sub. As Tolkien says above, I was hoping not just to draw on reality, but in the creation of a peculiar quality derived from Reality, and that this Reality would then flow into my world. I wanted the reader to lose themselves not in historical detail, but in story. I know there will be those of you who feel otherwise, but I believe that by suspending disbelief through world-building, the best historical fantasy actually puts the spotlight on story, thereby enhancing the emotional experience. It can get a bit complicated, but so can actual history. In the interest of simplifying, I made up a glossary doc. In the beginning it was just a reference for me. It has over 150 entries. I ended up rewriting it in the voice of the trilogy, including a pronunciation key for each entry, and I offer it out to beta readers. I’ve had several say they enjoyed having it, a few saying it was a necessity, and one saying it intimidated her so much she never read the book. But most have said they hardly gave it a glance. Literary Trip, or Trip-up? I know what some (if not most or all) of you are thinking. Something like: Are you nuts? Why would you trip up the reader? Why make it any harder for folks to get into your story? Why add something that will make it more difficult to get published? The names don’t have anything to do with the story, right? To answer those questions, in order: Perhaps (by whose definition? ); It’s not my intention; I hope it doesn’t, and that for certain readers it’ll aid in their submersion into story; Because being published wasn’t on my mind when I started; And that last one is a bit complicated, and perhaps is my point here (in case it’s not evident). For me, story emerges in part from world-building, and world-building emerges from names. So for me, the names have quite a bit to do with the story that emerged (I’m still a pantser, after all). I understand that a lot of the ‘tripping up’ of readers by names can be avoided through their judicious introduction, through their being woven into the fabric of story deftly, and I’m working on it. But I am pretty darn fond of them, and couldn’t be easily convinced to change too many of them. I mean, there was a time when names like Frodo and Gandalf, Hogwarts and Dumbledore all sounded bizarre, but can you imagine any other name for any of those? Back to those hunks of steel: The two named swords in my trilogy (Nahtsrein and Bairtah-Urrin for those who are interested—Ruler of the Night and Bringer of Light, respectively) are not magical. But they are more than mere weapons. They are emblematic of the leadership of the two ruling clans of the Gottari. They are just symbols, analogies for power—their importance placed upon them by the Gottari people. And isn’t that what story really boils down to? Stories are symbolic analogies for life. So what’s in a name? Quite a bit… In my book, anyway. What about you? Do you think I’m nuts? (On second thought, don’t answer that.) Do names trip you up? Do you think this is all just geek-speak, reminding you why you don’t read historical fantasy? Or do you feel names can enhance the story? Or do they make no difference, as long as the story’s good? This entry was posted in Writing and tagged Ainsela, Epic Historical Fiction, Gothic names, Goths, historical fantasy, JRR Tolkien, Latin names, Names, Old Norse, Romans, Story-Telling, Tom Shippey, World-Building. My childrens’ names even all have special meaning, and have at least a derivative of Micheal, meaning “of God”. I won’t bore anyone by going into detail on this. My mc’s name is Evie, short for Evelyn. I chose it because it sounds like “Eve” and this story is about redemption. Also,Evelyn means “Song bird”. I felt her voice was important to the story. She meets the “Chen Mal’ach” in the afterworld. Their name is Hebrew for angel’s grace. Boring to some, interesting to me. Their names play a huge roll in the process for me. Even now, they help trim the fat. World-building is tough work. We take what we can in terms of letting our imaginations fly, while giving the reader a sense of setting. Best to you in your revision edeavors. You always think outside the box and I admire that about you. See? For me, Evie conveys an instant impression. And finding out the backstory for the name only adds to that impression. I love the idea of the Chen Mal’ach! Thanks for sharing! I have admitted that fantasy and sword & sorcery is not my strong suit. Though, if I am battered with too many hard-to-pronounce – or impossible-to-pronounce – names in any genre, I am turned off. Your explanation helps, and I think the glossary will help as well. I can appreciate you wanting to use non-Americanized names in this genre. The story is the main point. Compelling, interesting, want-to-read-the-next-chapter sort of stuff. That’s what I like. And I’ll take notes and make charts on character names, kingdoms, and fighting factions if the story is good. I agree, the ‘which vowel’ thing can be tricky. Using my example of Ainsela, in my mind it’s pronounced AIN-seh-lah, but I’ve had readers pronounce it back to me as ain-SELL-ah. But they usually seem to have grown quite fond of her in spite of the way they pronounce her name. In live discussions with them, I always adapt to their pronunciations (why should they adapt to mine?). As I say, the smooth incorporation of them in the beginning is of vital importance, and the fact that I’m still working on that element nine years on shows you that I take it seriously. Maybe you’re right, and I could’ve moved on if I’d had more Annas and Ians. But I can be a stubborn old goat, so I trudge on, trying to do justice to what I believe is a good story at its core. I completely agree that a well-turned name can be every bit as effective as a descriptive narrative. With proper introduction it can evoke exactly the correct mood or foreshadow a character’s destiny or intent. It does, as you say, require some judicious weaving. As a reader, it’s so very hard to memorize unusual names when everything else about the fantasy world is all wonderfully strange and new, too. I mean to say that if I’ve just moved into town and everything is vastly different from my last residence, then your name could be Joe and I still might forget it. Too many new ideas create a sensory overload–unless, you give me an association of something familiar–night, light, malevolence, pride–then I’m not floundering for purchase, I’m making connections. We can memorize anything if we have a prompt or something to pin it to. That’s just how we’re wired. Your careful planning will create those associations. Your characters with live up or by their names and we’ll remember them well. I so look forward to the experience. I think you’re spot on about creating associations (by showing not telling, of course 😉 ) being the key to making them memorable. Great observation, D! As a reader, I sometimes find myself using a techinique where I just let it wash over me. I just trust my brain (and a good glossary, chart, or map) to have what I’ll need later. If I can hang onto the MCs and the immediate secondary characters, I don’t sweat the place names, sword names, etc. I know I did this in my first reading of LOTR (by default, I was eleven y.o.). In fact, I’m still not sure I know the difference between the Sindar and the Noldor elves. Great post — I’m 100% behind you on everything you’ve said, providing there is consistency in the naming conventions being used. In the case of your trilogy, that’s obviously the case. I only get thrown out of the story when the names of the characters are clearly derivatives of modern names without any consideration as to linguistic origin. eg. I find it difficult to believe that Ryuku, Niamh and Frejdisa all grew up together in a little Roman village. Also, the act of naming a sword makes it infinitely more interesting and exciting. Seriously, if given a choice, I’d much rather have the blade Macareadbhar, Bringer of Justice, at my side than a generic sword. Thanks for supporting my theory, Jo! And I was pretty committed to consistency as I did my naming. My Gottari all have Gothic language elements, Tiberians–Latin, Hellains–Greek, and so on. I had a blast doing it. Honest to goodness LOL on Macareadbhar, Bringer of Justice. Yeah, who would want to get the last of the swords from the leftover bin in the stable when the evil horde is at the gates? 🙂 Thanks for stopping by and leaving such a great comment, Jo! You are speaking my language! Names are the most important thing to me as well. That’s where I always start, a name. Even in my non epic fantasy, I choose my names carefully. Thanks for sharing your process and love for naming things. World building is tough, but so rewarding. I can’t wait to delve into your world again. I love each and every one of your characters, names and all! I would love to take a world building workshop from you one day, Vaughn. I could learn a lot from you! World-building without info-dumping is so damn hard, isn’t it? Thanks for loving my characters! It does my heart so much good. Such high praise only gets higher coming from you, my friend! Thanks for everything! Can’t wait to share book two with you, and to read your book two! I’m sorry to say names trip me up and have been a barrier to me reading Sci Fi and historical fantasy. This is consistent with real life, though. I tend to remember faces and stories, principles. I work doubly hard to retain names and dates. That said, I love a good name, particularly one which is distinct, yet gives that subliminal sense of character and sense of familiarity. Your glossary sounds like it will be a fantastic aid to your core readership! And as you said, you learned so much about your world by doing it, everyone will appreciate the texture it gives your writing. No apology necessary, Jan. Quick story: I was discussing names with Cathy Yardley, bemoaning the fact that a few of my betas had complained about my foreign sounding names, and she gave me a wise response. First, she asked me if those readers were normally fantasy/scifi genre readers. I said no, and she said not that it didn’t matter (as I expected), but that I should ‘expect’ non-genre readers to find those elements (particular to the genre) disagreeable, just to ensure I’ve gone far enough with them for my Right Readers. I was sitting at a gathering last night, sipping wine with some folks from my community. These are people I’ve seen and spoken to many times. This post was on my mind. I scanned the crowd and realized I could not recall the names of about 30% of them. But ask me the house names and sigils for all of the Seven Kingdoms of Westros, and I could come up with 90%. Funny how the brain works. As I said, I’m a glossary guy, so I was a bit surprised by how few have looked at it or used it. But I’m still glad I did it, because the few who did really appreciated it. It would’ve been worth the effort even if it was just for me. Here’s to hoping for readers appreciating texture! Thanks so much for your support, Jan! I’m of two minds on this, Vaughn: I’m like Jan in that I hate strangling on names, especially if they interfere with my ability to comprehend the story; yet in order to move the reader’s mind into a certain mood, unusual names are often necessary in fantasy. I liked the way Mazarkis Williams handled the names in The Emperor’s Knife and Courtney Schafer did a wonderful job with The Whitefire Crossing. The names were unusual but not jarring–they invoked a period and a place for me. At the same time, I didn’t feel like I had to keep flipping back and forth to remember who was who or what was what. In Miserere, I used very normal names that evoked the individual’s original country and religion. Because The Garden is a historical fantasy, I have used Jewish and Spanish names. In my uber secret project, the names are corruptions of Turkish and Armenian names, which I’m finding a bit overwhelming in the synopsis. I don’t know how that will come out in the end product. Here is the most important thing to remember: nothing should distract your reader from your story. Period. If you can use unusual names and pull that off, go for it. I’ve found that keeping the names brief (three syllables at the most) and very distinct in spelling is very helpful. When I work with unusual names, I also try to introduce the characters and places very gradually so as to cement one in my reader’s mind before moving to the next. Hi Teresa! Great to see you here. I’ve actually been put off by names that are too ‘normal’ sounding. For example, I think part of my problem getting into Terry Goodkind’s Sword of Truth was the name Richard for his MC. So I agree that unusual names are often a necessity. I’ll have to check into Schafer’s and Williams’ work. Thanks for the recommendations. Teresa, that was just it, re: Richard. A few of the other names from Goodkind’s world of D’Hara are Kahlan and Zeddicus Zu’l. JMO – I know a lot of people love the series. Ah, there’s another fantasy writer on my TBR list: Alex Bledsoe. I enjoy his web presence. Thanks again! Names are definitely important. I think a name needs to fit the character, whether it’s unusual, difficult to pronounce, simple, or meaningful, it just needs to feel right. I like unusual names and have never found myself tripped up by the tough ones that seem to crop up so frequently in sci-fi and fantasy. For me the names add an element of other-worldliness to the story. I can’t wait to read your work Vaughn. You’ve put so much time and thought into every detail. It’s going to be amazing. Names are terribly important! I have a huge attachment to names (which may come from my own real life experience of nearly having my name changed against my will–dad, new wife, long story), and I don’t take them lightly. In the one straightforward fantasy I wrote, I thought a lot about names, and some of them have meaning from actual myths, stories, languages I know. I few were more made up. But once I get that name in my head, I resist changing that character’s name. I don’t mind books with crazy named characters, especially if the author seems to have a logic behind it (even if I don’t know what exactly, but a reader can tell, I think). Sometimes it feels as if a writer is trying too hard to use a quirky name, but once I start reading, if I like the story, I believe in the name. I think you’re right, Marta, that readers can tell if there is logic behind the naming process. Tolkien’s process had a lot to do with myths. I stuck mostly to linguistics, but most were from dead languages (Gothic, Latin, Old Norse), so I think (hope) they carry a mythic feel and convey a logical system. I’m resistant to changing them once they’re set in my mind, too. I shudder to think what I would do if I got a publishing deal and the editor came back and told me to change many of them. Fingers crossed that it won’t be an issue (and not because I’ll never have said editor 😉 ). I think names are important to how we see each other (and ourselves), and so would influence how we get to know a character. So much information (and not just in the translation) is contained in a name. Naming is not my strong-suit, but I thoroughly enjoyed coming up with place names, regions and types of animals in Finding Meara. Names only trip me up if they have totally bizarre spellings. The names you listed above are pronounceable, but some books I’ve read I skip over trying to pronounce the names because they are so difficult, and then get really confused because I don’t have a way to mark which character is which. This was a fabulous post! I so agree that the look and sound of a name transmits so much information. I’m not so sure naming is my strong suit, either. But I enjoyed it, too. And I think that’s what’s important. I think we have to pour our joy into every aspect and element of our word to sound authentic on the page. By the way, my wife’s a skipper-overer, too, utilizing the first few letters for ID. She was put out with pairs similar names that were too similar, so I tried to avoid them. Thanks for reading and commenting, Lara! I’m glad you enjoyed the post! I don’t think I’ve ever stopped reading a book because of the names. I do like historical fantasy, and I do appreciate a glossary (because I have a terrible memory). I agree with you that the names are intrinsic to the story. It also sounds like your process of generating the names is part of creating backstory on the characters, the biographies that help you get into their heads. Makes sense to me. I recently wrote a fable about adolescent angels and another about sybils. Both times, I relied on research into names as a way into the characters I was creating and, by proxy, into the story. I read one of your fable posts, and loved it, Lisa! Sounds like our ‘process’ is working for both of us. I’m so glad to hear you like historical fantasy. It does my heart good because I think my Right Readers are women. I’m hoping there’s an audience for what I’m doing. Thanks so much for reading and commenting! I enjoyed and appreciated reading about your experience in naming characters, etc. I love creating names – it’s awesome fun. But naming a sword isn’t all as easy as it sounds. I spent hours – nay, days – working on sword names and I still don’t have the perfect names. I applaude you for your well chosen sword names. What language are they based on? I think naming the swords was among the most difficult of the names I invented. The language is a dead one–Gothic. 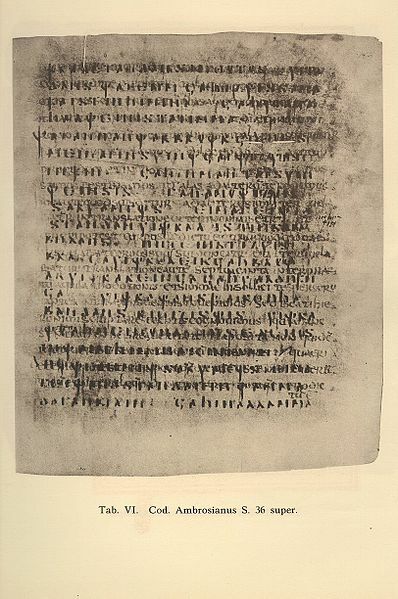 The only translation key that survived is the Codex Argenteus, which is the Goth Ufilas’s 4th Century translation of the Greek Bible to Gothic. I started with wanting the dichotomy of dark and light for the names, and went from there. Thanks for reading and commenting, Pat! Good luck with your series!